Thanks to many advances in medical technology and health care, people are living longer. While this is generally a great thing, it does lead to more financial planning decisions as you think about quality of life in your later years. Considerations include where you will live, who will take care of you, if you need help, and how will you pay for increasing medical care costs. The way we receive care later in life is changing, and so are the ways we can pay for that care. Here, I’ll share some of the current trends in financing elderly care and when to start considering your options. The nuances around these criteria and how they are applied by the program can be very confusing. Here’s an example to help illustrate some of the complexities of Medicare and why relying on it long-term isn’t a good idea. A client was hospitalized for several months with an illness and was released directly to a nursing home. Upon being released, she was still very sick and needed around-the-clock skilled-nursing care, and therefore qualified for Medicare. As her condition improved, she transitioned to rehabilitative care. This was also covered. However, after a couple weeks, the client refused treatment due to the amount of pain it caused, so Medicare stopped paying. She later continued treatment and coverage resumed. After some time, the client was notified her stay would no longer be covered as she wasn’t making enough progress in their rehabilitative treatment. This led to a series of appeals and a lengthy administrative process by the client’s loved one and legal power of attorney. She eventually progressed in her rehabilitation, and Medicare once again agreed to cover her stay. After a couple more weeks, she was told she had made sufficient progress and no longer needed rehabilitative care, despite the fact that she could not dress herself, use the toilet or bath without assistance, could only walk a limited distance, and was not able to transfer from a bed to a chair by herself. She then had to pay for care from her own resources. If you qualify, original Medicare pays the entire cost of the first 20 days in a nursing home and then covers some of the cost for another 80 days. And Medicare isn’t even an option if you should need assisted-living or dementia care. For a complete list of requirements, visit Medicare’s website. I’m often asked, “Can’t I just give my assets to my kids and then qualify for government assistance?” It is possible to transfer assets to others if done five years in advance and within gift tax limitations. Otherwise, the government has the ability to “claw-back” gifts made within the prior five years. Even with the best of intentions, caring directly for family members long-term frequently becomes impractical. At some point, spouses or parents may need around-the-clock care and the services of professional health-care providers. Many shudder at the thought of using a lifetime of savings to cover end-of-life care, while others simply lack the resources to do so. That’s why it’s important to address financial planning and living arrangements, for yourself or for your parents, before problems arise. An option to help pay for that care is long-term care (LTC) insurance. But there are several things to be aware of before you buy a policy. First of all, insurance companies underestimated the amount of claims in prior years, which has resulted in higher premiums and fewer choices today. In 2015, there were only 15 companies providing stand-alone LTC insurance policies compared to 125 companies in 2000. So, it’s important that you select an insurance company with a high credit rating and the financial security to honor commitments to LTC insurance policyholders. And LTC insurance can be costly. Like home or automobile insurance, if you don’t use the insurance, you lose the money you’ve spent on premiums. However, this coverage can provide valuable benefits, if needed. Today, a policy with these parameters would have an annual premium of $1,256 for a 55-year-old man and $1,898 for a 55-year-old woman (because she is expected to stay longer). The cost for the same coverage for a 65-year-old male (female) jumps to $2,249 ($3,405). And of course, a policy with a cost-of-living adjustment to enable benefits to keep pace with rising cost of care, would cost more. Financially, it may seem logical to wait to obtain coverage, however, nearly half of those who apply for LTC insurance at ages 70 to 79 are denied coverage. Some good news about traditional LTC policies is that nearly all now cover home health care, which used to be a rider (at additional cost) in older policies. This feature provides the flexibility to receive benefits at home, rather than having to move into a senior care facility. Another option is hybrid life insurance/LTC policies. While these come in many varieties, hybrid policies typically allow you to use your death benefit early to cover the cost of care. The proceeds you receive to pay for long-term care reduce the policy’s death benefit. While there is no separate cost for long-term care insurance, a policyholders’ return on investment is materially impacted based on whether they receive payments for long-term care. The terms of these policies can be extremely difficult to understand, so you should consult a financial advisor before buying one. For more information about LTC insurance, visit The National Association of Insurance Commissioners, an organization for insurance-industry regulators. Like any other type of financial planning, it’s best to discuss your vision for your later years with family and advisors early. While end-of-life conversations can be uncomfortable, various potential scenarios should be considered before stressful situations occur and while everyone is still healthy enough to make decisions. Determine the type of medical care you’d like to have later in life and its associated cost: Would you like to have private care in your home? Will loved ones help provide care? 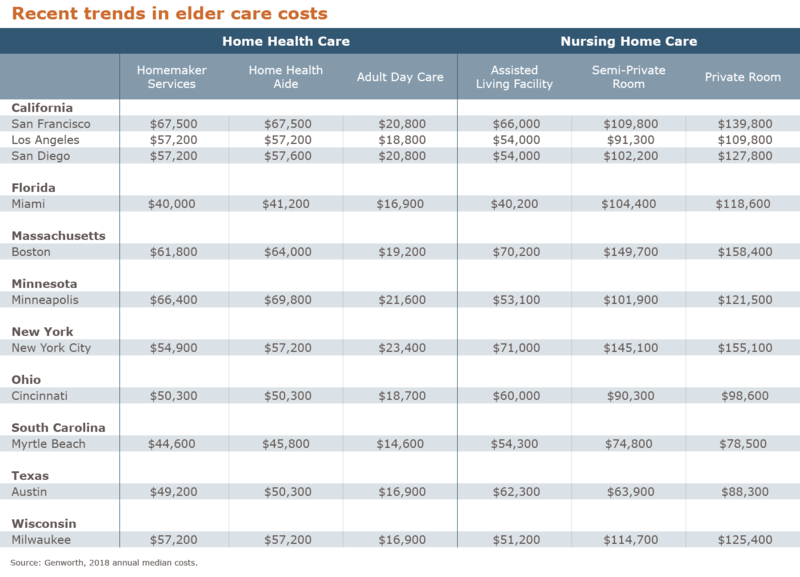 If you should need skilled nursing, which facility would you choose as costs vary greatly? If your parents are living and you haven’t discussed these things with them, consider reaching out to them soon to fully understand their wishes and needs. Also, a financial advisor can evaluate various potential scenarios to help you and your family make the right financial choices for long-term care. 1Economics and Benefits of Private Long-Term Care Insurance; Marc A. Cohen, Chief Research and Development Officer; LifePlans, Inc.
4Estimates by Genworth Financial Inc.
As with any financial decision, carefully consider what you want to achieve and talk with your licensed insurance agent or advisor to assess your need. This material is provided for informational purposes only and is not advice or a recommendation for the purchase or sale of insurance. This information has been developed internally and/or obtained from sources that Aspiriant believes to be reliable; however, Aspiriant does not guarantee the accuracy, adequacy or completeness of such information. We do not suggest that any strategy described herein is applicable to every client. Before making a decision about purchasing insurance, you should consider, with or without the assistance of a professional advisor, whether the information provided is appropriate in light of your particular needs and financial circumstances.